Overall this ship was the hardest to citadel. This ship has a turtle back that makes it nearly impossible to citadel under normal circumstances. Overall, I found this ship surprisingly easy to citadel, even more so than the republique (though it may be luck and RNG). I've even had a double citadel in a Random battle using this new found knowledge recently. From the armor viewer, this thing has a turtle back of sorts similar to the Gkurfurst above. In my testing this ship sits about a medium difficulty to citadel. I noticed it doesn't have the same weakness that the North Carolina, but the citadel box isn't thick enough to shatter shells. Somehow, I found it easier to hit than the North Carolina but harder than the Republique. I put this one at a medium difficulty. 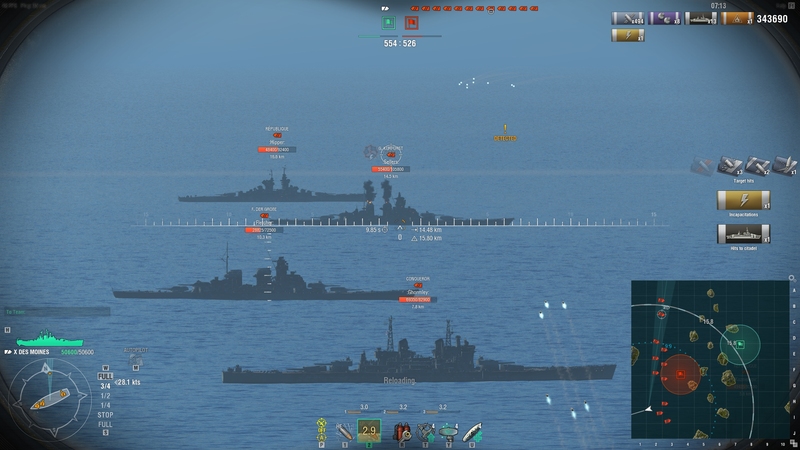 Hilarious, did you happen to notice I was using cruiser shells? Actually the ship he is using only has 280ish mm of penetration at 10km, its also falling at around 11 degrees. It would be nearly impossible for him to score citadel hits at 10km since each of those ships has at least 305+ mm of belt armor. This means he can't punch through those belts, the thing is the Iowa belt armor extends a decent amount under water but is fairly weak. I've been curious about the underwater dynamics on shells in this game, no one seems to have a solid answer except the shells detonator timer sets as it hits the water, but does the water slow the shell, does it cause the shell to lose penetration? @LittleWhiteMouse if I recall correctly you were looking into this a while back, anything new? Im not sure about shell dynamic's. I learned about hitting citadels near the waterline, from some of the top streamers, who have are or had played WOWS at some point. 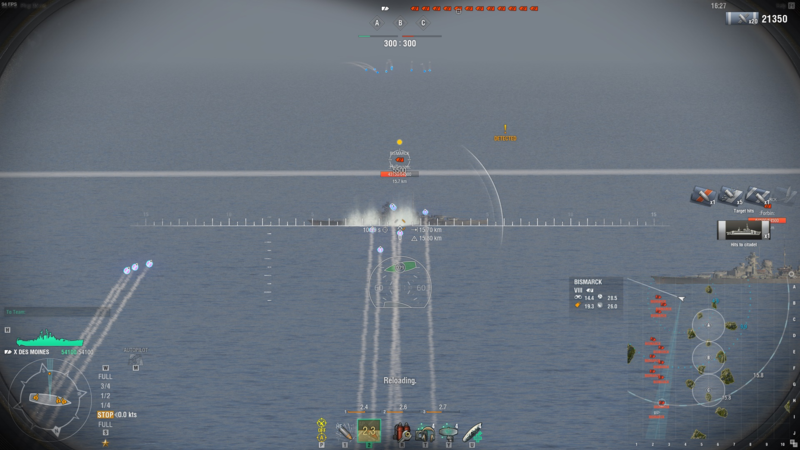 Yea --- Des moines and AP plus broadside BB, in most cases equals death. North Carolina is easier to citadel by hitting the main battery barbettes, they're paper. Or at least that's what I've found. 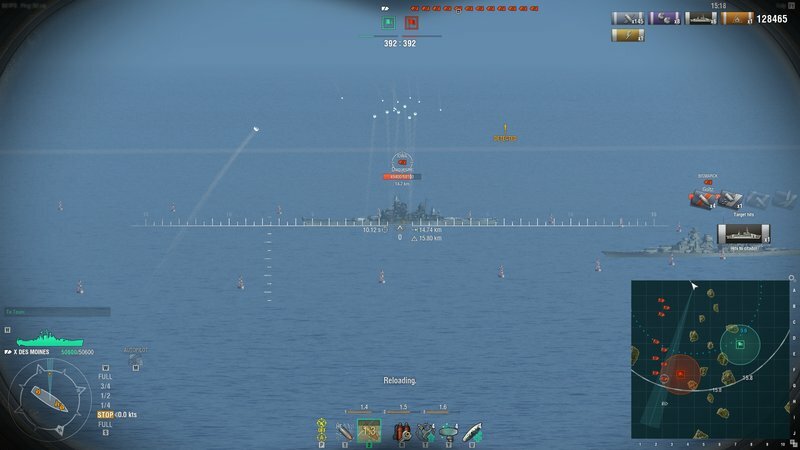 This is generally whats being hit when people get citadels on BBs since WG sunk or hid the actual citadel. I feel confident in saying I've never had an underwater hit, despite the fact they're supposedly definitely possible. I'll aim at the waterline with 6 shells, one will go over, 3 will hit and two will splash, one inches from the vessel but not doing anything and the other yards away. My suspicion is that those aren't "underwater" citadel hits, but rather plunging fire hits thru the deck armor into the top of the citadel. At 13+km in the DM, you're far more likely to be penning thru the deck than going thru the side of the ship. In the case of the NC, you're hitting the 37mm deck then thru the 19mm citadel deck. As long as you don't hit any guns or superstructure, not anything special. For the Iowas, it's a 38mm deck then a 16mm cit deck. 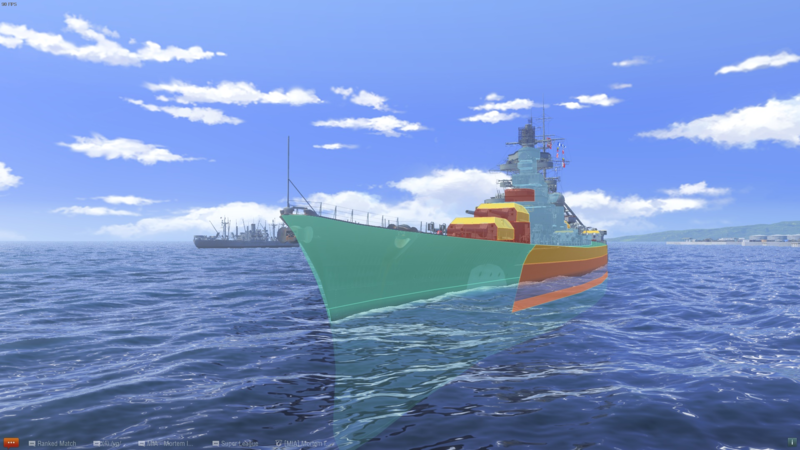 Iowa's likely seems easier because it's a larger ship, so you have more open deck to pen thru. It's the same reason why most BB's can't cit the German/UK BBs at close range but at medium to long range they can. At those ranges they're able to have shells fall thru the deck armor and pen the top of the turtle back rather than trying to go thru the side. If that were true, I would be able to citadel the Montana the same way since it has a 19 mm citadel roof armor under it's deck, but try as I might I couldn't do it. Also to a lesser degree the Yamato with a 110 mm Citadel box roof. 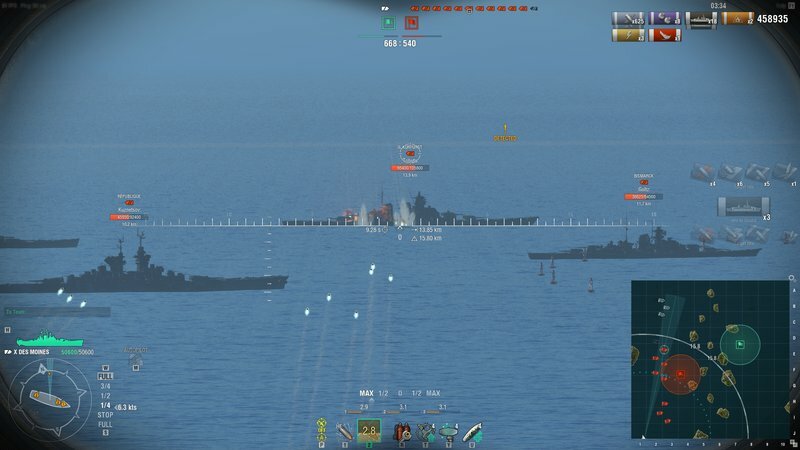 Though I can citadel the Yamato at point blank between turret one and two. Both of those ships have a pretty nicely armored citadel under the waterline. Not very easy, but still easier than the North Carolina so far. 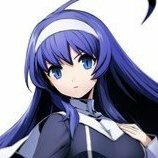 Though thinking about it, it might just be that the North Carolina is rather small and doesn't have that many hit points for me to test with for too long. I've taken a citadel in each of my last few conqueror games. Each time I was angled enough that it should bounce a shell. Protection from underwater penetrations needs to be improved. Except autobounce for US AP is 22.5°. But I've got a few questions. Where are you getting that angle measurement. 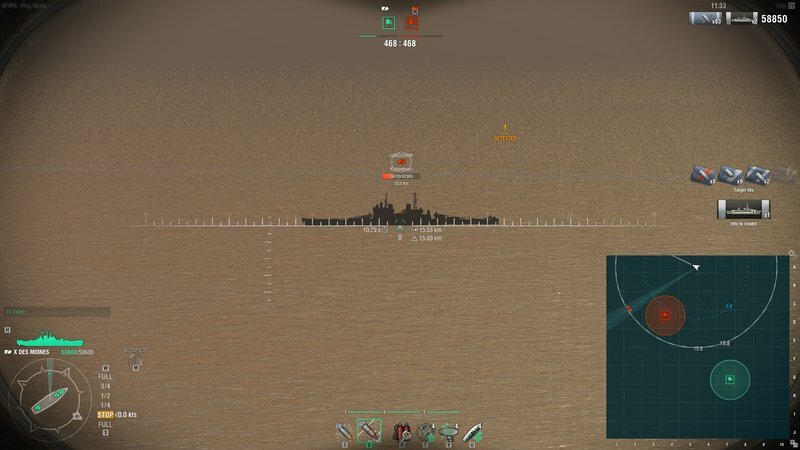 AFAIK WG has not made any tables available that show the actual angle of shell impact at various ranges for each ship. The posters here have cited anywhere from 11° to 22°. Where are you guys finding that info? Unlike BBs, cruisers and DDs do not have their range artificially capped, which means for them plunging fire is possible. Now what ranges those occur, I don't believe WG has disclosed their shell arc model unless you guys have info that I haven't seen. What's the arming time on DM AP? I wonder if the reason why the Monty evidently can't be cit'ed is because there is enough distance between the deck and cit that it for all practical purposes serves as space armor. It looks like you're firing at near max range on the iowa, GK and Conq so at those distances you shouldn't be able to pen the side armor. 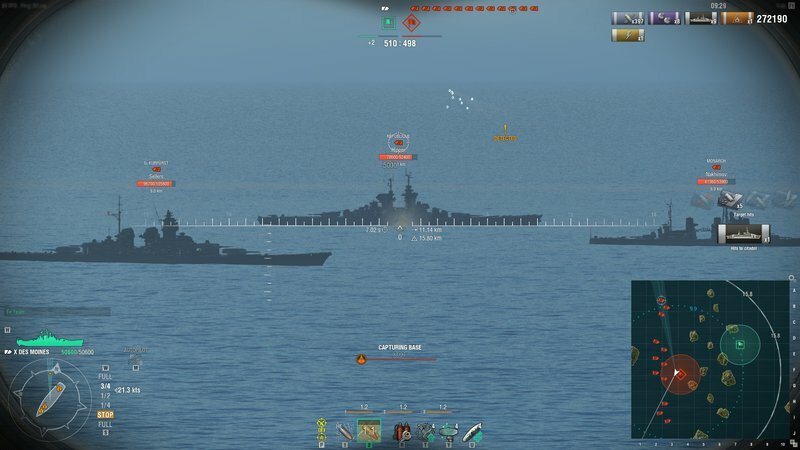 In my experience, aiming is only about 50% of the equation - you have to be lucky, too (at least when it comes to distance shooting as a battleship). RNG is a fickle mother. Can't tell you how many times in the last weekend alone that someone has screwed up against me by presenting a full broadside, my salvo has been absolutely perfect, and the results totally unsatisfactory. 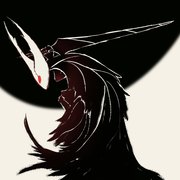 While it is probably necessary element of the game, it is also an intensely frustrating one. I need an explanation to how this is possible. Des Moines at max range and martel at 10km have similar pen of armound 200mm. So how can citadel hits like this happen? but now I think its something more. "Oh look, this fool is presenting a flat broadside. Time to delete him." "...or I can settle for a a couple of overpens...sure..."